Tales of Wychwood is available for free from 15-19 March 2018. There are many special places in the world, places rich with history and legend, blood and life, love and death. Of all of those many places, none is more special than Wychwood Forest. Wychwood, the small remnant of a forest that has once spanned the width of England, is far more than your average woods – it is a prison that holds fierce warrior elves, bloodthirsty headhunter dwarves and darker creatures, still. For hundreds of years a family of humans has helped the elves to protect the forest and those who roam within. 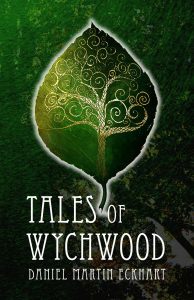 Tales of Wychwood is the story of a one-of-a-kind grandmother and her grandchildren, who are about to discover everything about their glorious secret ancestry. Join Nick, Milo and Ellie as they enter a fantastical world filled with deadly dangers, high adventure and darkest mystery.